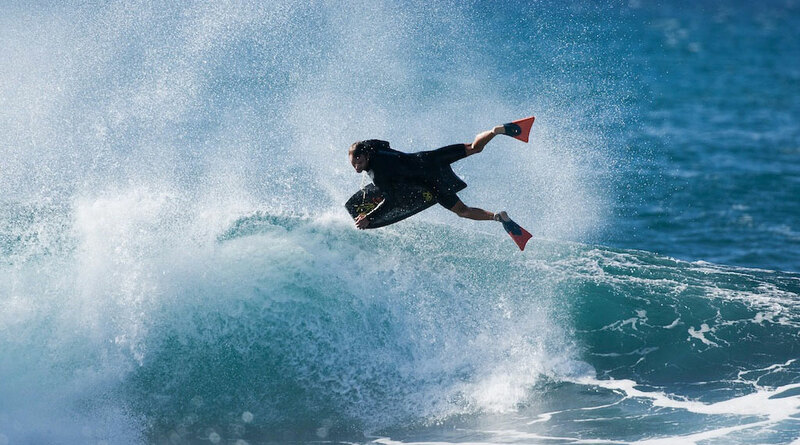 NMD Bodyboards give distinctive performance, style and finesse to your bodyboarding. Innovative high tech designs, materials and constructions come together in NMD’s comprehensive range for Beginner and Pro riders. The result, as NMD like to say, is that your riding ‘oozes performance’. NMD innovation comes in the form of both their own patented technologies, and refinements of proven bodyboarding materials and constructions. At their high end the Parabolic Flex System, now in its third generation, is a patented construction technique. Lightweight strong vertical beams are placed strategically through your board’s foam core. The result is a flex pattern optimised for both carving and speed surfing. So your rails have greater flex for carving on the wave face. The core meanwhile remains in and returns quickly to a flatter rocker. So you get speed when transitioning between turns, when you’re racing a barrel or launching to the lip. Another high end feature is the Parabolic Base. Alternate foams are inserted into the rails. These maintain the board’s rocker and shape integrity. This means your board can be thinner without becoming weak or floppy at the ends, so you get greater responsiveness. Channels have also been redefined. Called Vapor Tracks NMD apply small ridges running on the bottom of Pro Ride models enhancing water flow giving you a speed boost. Taking the proven PE, NRG and PP technologies, NMD have added refinements to give your riding an edge. For their PE, flexier core, they use Ethafoam. This a trademarked true-to-the-feel reproduction of the industry standard foam ideal for heavy carving and cooler waters. Balanced performance foam comes in the form of the NRG+ Core. This also is a trademarked foam giving great flex with more recoil so you get a livelier faster ride. For their PP rendition NMD use a Kinetic Core. So that you get a high speed dynamic response. NMD configure this core for each of their models so you get the highest performance in specific conditions. For example a stiffer version for launching, a flexier version for carving. NMD combine their innovations with a wide range of great features to give you a complete high performance package. So whether you’re a Beginner or Pro you can charge with style. These features include XLF Armour, an enhancement of bumpers that surround your board so you get greater durability, protection and strength. For slicks there’s Waveslick giving you speed. At the high end authentic DuPont Surlyn is used so you get added overall performance and durability. There’s single and double React Mesh that can be added beneath your deck and slick. This diamond mesh creates a strengthened tensioned layer so you get a more instantaneous and boosted recoil as you come out of each turn. Stringer’s likewise come in the form of single composite rods, and triple sets named the Trident Stringer System, TSS. The TSS consists of composite epoxy fibre tubes, two shorter outrigger stringers and a longer tube in the centre. The result is greater strength and recoil without being too rigid. The TSS comes in Prone and DK Drop Knee optimised layups. Bull Grips, Traxion and Ergonomic Deck Contours and a heap more NMD features add up to a total package for you. The NMD range is comprehensive covering Beginner to Pro riders. A great feature of their website is the visual identification of key board characteristics across their range, with explanation added. You can easily see board flex, rocker and water temp characteristics, their effects and so how they best suit you. Along with great boards NMD offer you stylish and functional accessories. From heavy duty wheelie board bags, to backpacks, to wrist and bicep leashes and fin savers. Ben Player even has his own Signature bicep leash so you get a superior design and materials for a better connection. 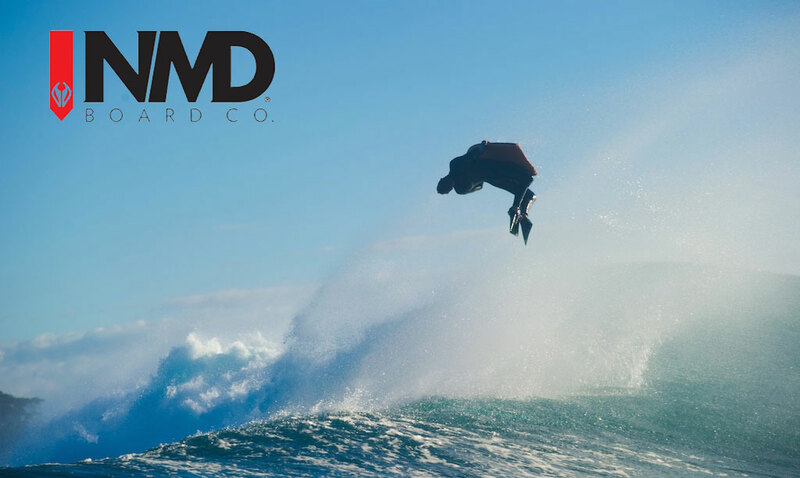 NMD give you high performance bodyboarding with innovative design, materials and constructions Team riders like the highly awarded Ben Player and Jase Finlay show the big power moves, along with the style and finesse, NMD give to your bodyboarding.